Desktop Publishing Supplies brand Blank Parchment Certificate Paper with Green Border is the top choice by professionals for creating award certificates. 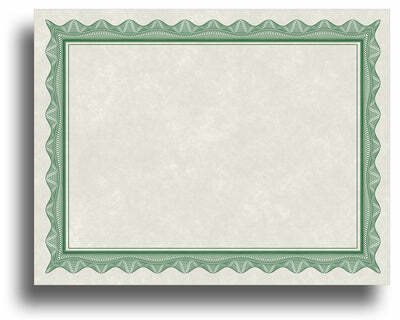 This certificate paper is great for honoring achievement, excellence, and contributions. Not only does it feature a beautiful, yet classic design, it is also created on a premium stock, measures a standard size, and works in all printers!